Millions Brace For Record Category 4 Strike [VIDEO] - Joe.My.God. Hurricane Florence will lash the Carolinas beginning late Thursday as an intense Category 4 hurricane with life-threatening storm surge, destructive winds and massive inland rainfall flooding in one of the strongest strikes on record for this part of the East Coast. Tuesday morning, a hurricane watch and storm surge watch were issued for the entire coast of North Carolina, including Albemarle and Pamlico Sounds, and the South Carolina coast as far south as Edisto Beach. This includes Charleston, Myrtle Beach, Wilmington and the Outer Banks. Florence appears to be replacing its eyewall Tuesday morning, something that can happen multiple times in intense hurricanes. During this period, the hurricane may weaken a tad, but then gain strength again as the outer eyewall contracts inward, replacing the old inner eyewall. “This is going to produce heavy rainfall, and it may not move very fast. 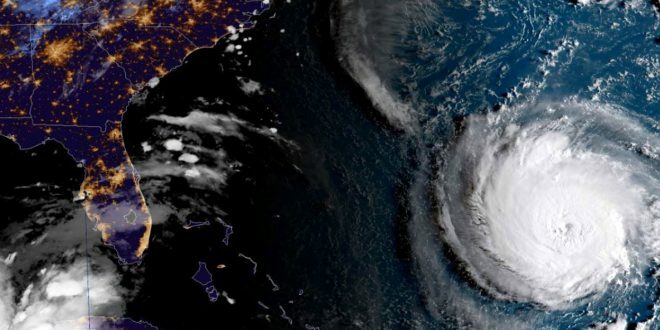 The threat will be inland, so I’m afraid, based on my experience at FEMA, that the public probably not as prepared as everybody would like,” said Craig Fugate, former director of the Federal Emergency Management Agency. National Hurricane Center Director Ken Graham also warned that Florence is expected to linger once onshore, downing trees, knocking out electricity and causing widespread flooding. The storm’s potential path also includes half a dozen nuclear power plants, pits holding coal-ash and other industrial waste, and numerous hog farms that store animal waste in massive open-air lagoons.